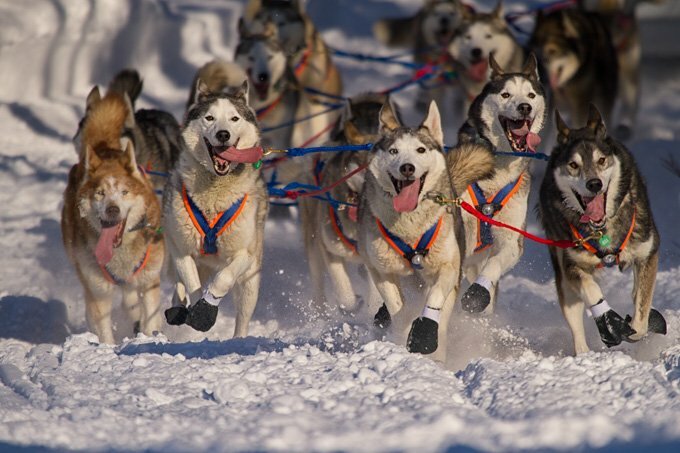 The Iditarod, Alaska’s most famous sled dog race, began this past Saturday outside Anchorage. Each year, the event stirs up controversy among those most passionate about man and woman’s best friend. The race starts on March 4th of this year (2017). 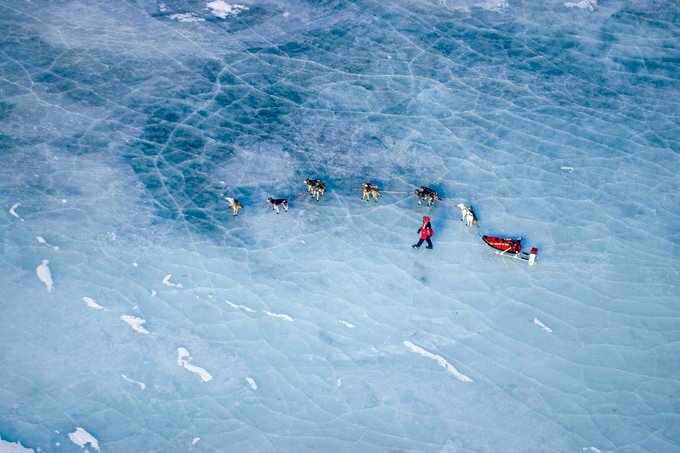 Iditarod opponents contend the race is nothing less than abuse, that the dogs are driven to exhaustion, forced to perform in the face of severe frostbite, broken bones, pneumonia, and dehydration. Supporters argue these dogs are among the happiest and most cared for animals in the world, basking in the opportunity to do what they were born to do. I don’t pretend to have the answers; I’m merely asking the questions. Any time we humans solicit an animal to perform for our benefit, we can only guess as to the animal’s level of enjoyment or stress. From agility competitions to kennel club shows to rodeos to the running of the bulls, each event can be plotted at a point on a spectrum. Where the Iditarod falls is up for interpretation. Palfrey has a point, but is it the relevant one? Of course, marathon runners maintain a particularly spare weight to ensure the greatest advantage in competition. The difference is that the dogs aren’t given an option. They adhere to their musher’s exercise regimen, they rehydrate when their musher decides it’s time, they rest only as long as their musher permits. 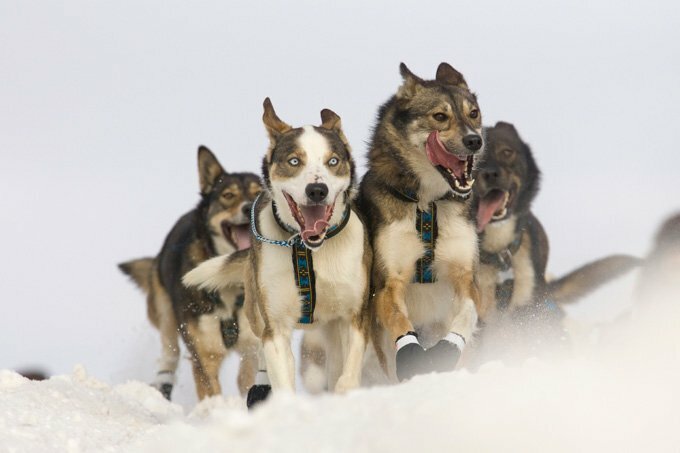 Proponents say the sled dogs are bred not just to run, but to race. Whether breeders can select for a particular distance or a certain set of conditions, I don’t know. Is it safe to assume their genetic makeup means they relish running 15 miles a day? Twenty miles a day? Marathons? Does being “bred for the sport” mean the dogs are born with the capacity and desire to run 10 back-to-back marathons? Or 20 back-to-back marathons? Or 30 back-to-back marathons in biting wind, sub-zero temperatures, over grueling terrain with only fours of rest? I don’t know the answer – I only know the Iditarod is the equivalent of 42 back to back marathons: 1150 miles in 10 days. Maybe it is a fair assumption – that because these dogs were bred for it, they indeed would choose to exert themselves to the point of exhaustion. They may well live to run. But to race? Just as with horses or Greyhounds or pigeons, races are for humans. As is glory, fame, and prize money. I’ve never seen a dog express an interest in winning, only in doing what he enjoys. My guess is that a dog would not run 100 miles a day for ten days straight – I’ve never heard of a dog doing so out of pure enjoyment – but admittedly, I don’t know. Jan Bullock, the Iditarod’s head vet technician acknowledges, “Most of the injuries I see are from running… They’ll get some swelling in their wrists and it’s painful.” And according to a study published in the Journal of Veterinary Internal Medicine, 61 % of dogs who finish the Iditarod suffer gastric ulcers, which the researchers believe are caused by “sustained strenuous exercise.” Still, many claim that the dogs would tell you the risks are worth it. Even more interesting to me than the statements from Iditarod supporters is the psychology behind how people justify their actions. For example: Rob Rogers purports to love, admire, and take excellent care of his strong, athletic dogs. He says they were bred for this life – they not only enjoy it, they choose to do it. Rogers, however, is not an Iditarod competitor and is not referring to sled dog racing. He’s a convicted – and proud – dog fighter talking about his Pit Bulls. Make no mistake: I’m not comparing the Iditarod to dog fighting. But I am drawing parallels to the arguments humans make to justify a favorite pastime or gainful vocation. Even compassionate, decent human beings fail to live a wholly benevolent life. The best, smartest, kindest of us are flawed. How did Thomas Jefferson justify owning slaves? How did JFK (or Gandhi or FDR or MLK) justify cheating on his wife? How does the average American justify eating veal? Or cheese? Or eggs? Is it worth finding out what life is like for the typical dairy cow or is it acceptable not to be concerned? Ok, so what does eating veal have to do with the Iditarod? Perhaps not much. But if animal welfare is mapped on a spectrum, at some point a line is crossed. Where is that line? How much gray area is there? Where does compassion end and cruelty begin? And is that for humans to decide, simply because we can? I enrolled with my dog Uno in an agility class. I loved it. But did he? Where is agility training on the spectrum? Where is the Iditarod? Where is dog fighting? We humans use animals to assist with hobbies, keep up with fashion trends, earn paychecks, and fill our plates. We owe it to them to keep asking questions and to take into account their potential suffering. You may not agree with my conclusions, but the conversation must continue.